This short film is a simple historical reenactment. It was produced, as was “Drama in a Gypsy Camp,” by the up-and-coming Alexander Khanzhonkov, who seems to have had a taste in Russian-national themed movies. He retained Vladimir Siversen, the director/cameraman, to shoot this picture, but handed the reins of directing over to Vasily Goncharov. This was probably wise, Siversen seemed to find both directing and cranking the film a bit overwhelming in the last outing, but here the camerawork is consistent and Goncharov seems to have been comfortable keeping the actors in line (liner notes tell us he relied on assistance from Pyotr Chardynin, who plays the father of the groom, in this). The entire movie is shot on the same stage, with only slight changes in decoration and costume to signal the difference between the bride’s room and the groom’s. The wedding hall is decorated with an elaborately-painted backdrop like something out of “The Cabinet of Dr. Caligari,” but for the most part the art is fairly restrained. All of the actors are shown full-frame, nobody’s feet are cut off, and with considerable headroom, making them appear quite small and indistinguishable on the screen. You’d never recognize any of these actors if you saw them in a different costume. 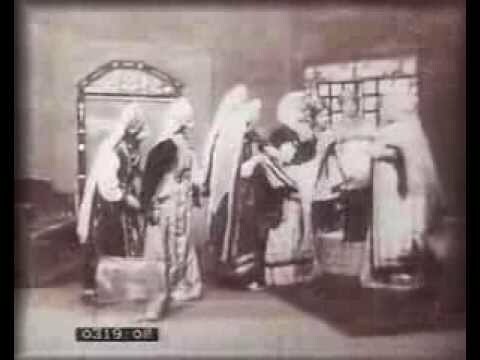 The costumes emphasize the fact that this is an upper-class wedding, not a peasant affair, although some of the dancers at the wedding have more austere clothes, once again a comment on the presumed class of movie-goers in Czarist Russia.